Made from the bark of the Lokta bush, this handmade origami paper provides stiffness and durability for any origami folding project. 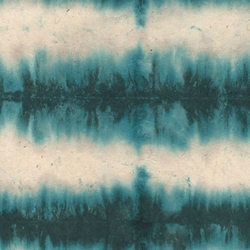 Both the face and the reverse features a tie-dye design in teal blue against a natural paper. Blotto - TEAL - 6"
Blotto - TEAL - 9"